Last week I was thrilled to talk with Jian Ghomeshi, host of The Q on Canadian radio, about the career, influence, and legacy of James Gandolfini. We had a brief, but fun and lively conversation about the legendary actor. It is available for listening at the Q’s website on the 6/21 podcast. My segment begins around the 12 minute mark. 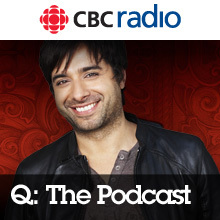 Jian Ghomeshi is a sharp host and he runs an entertaining and stimulating show. I was honored to receive his warm welcome to the airwaves. This entry was posted in David Masciotra, Television and tagged CBC, David Masciotra, James Gandolfini, Jian Ghomeshi, The Q by davidmasciotra. Bookmark the permalink.